Since the shuttle Columbia exploded over Texas in 2003, NASA has been extra-careful in its manned spaceflight operations. That explains why two shuttles, Atlantis and Endeavour, are being prepared for a mission to fix the ailing Hubble telescope, reports the AP. Atlantis is headed up to fix Hubble. But if something goes wrong -- say, a piece of space junk punctures a hole in Atlantis' head shield -- Endeavour will be launched to rescue Atlantis' crew. This mission is particularly dangerous for a couple of reasons. First, Hubble is nowhere near the International Space Station, so if something goes wrong, Atlantis' crew can't take refuge there while a rescue plan is devised. Second, Hubble has a particularly high, "debris-littered" orbit. If something goes wrong, the Atlantis crew can survive aboard the damaged spacecraft for 25 days before their oxygen is depleted. 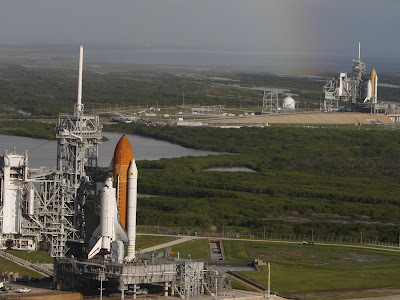 Endeavour can launch six days after the first sign of trouble. If a rescue is attempted, Endeavour would take off with a crew of four, grab the damaged craft with a robotic arm and Atlantis astronauts would need to float through space to climb aboard. There's a 1-in-185 chance that space junk or a small meteoroid could damage Atlantis. Launch is scheduled for October 10th.